My Friend Lynn – Art's Musings, etc. Lynn Messinger was one of the smartest people I’ve ever known. I’m not even sure that he ever graduated from high school, but he could have been one of the top scientists of our ages. A book could (and should) be written about him, and I plan on posting regularly about him, because he was a major force in our lives for many years. He was talented at anything that he was interested in, and he could piss people off more than anyone I’ve ever met. He was my best friend. 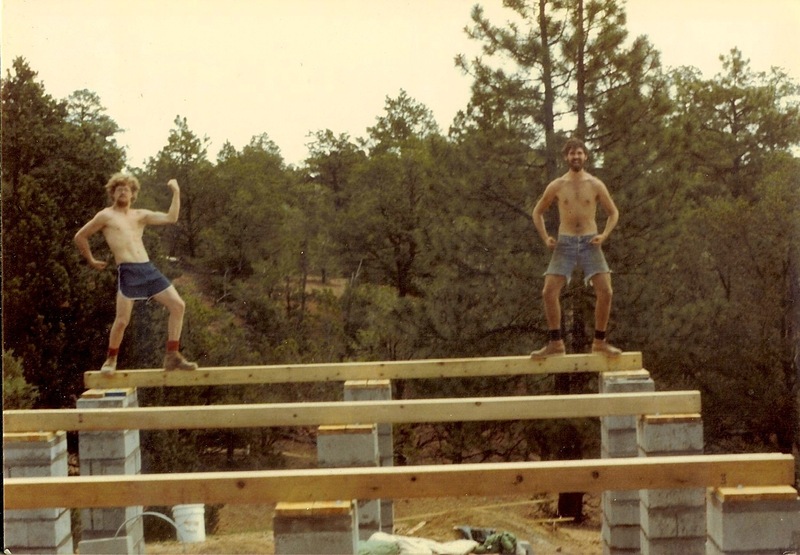 Lynn (left) and Art on joists of our house in the woods. It is hard to even know where to start. Lynn and I were classmates at St. John’s College. We were in every class together that first year, but I didn’t get to know him well until the summer after I quit and he was kicked out (and trespassed from campus). Lynn grew up in several different National Parks (his dad was a ranger), and I’m convinced that this was the basis of his free spirit. He spoke his mind in class, often skipped, and was well known for walking on narrow ledges on high walls, bridges, or buildings, and he was famous (infamous?) at St. John’s for vomiting on the ceiling of his dorm room. Let me introduce Lynn with a story (one of many possible starting points). 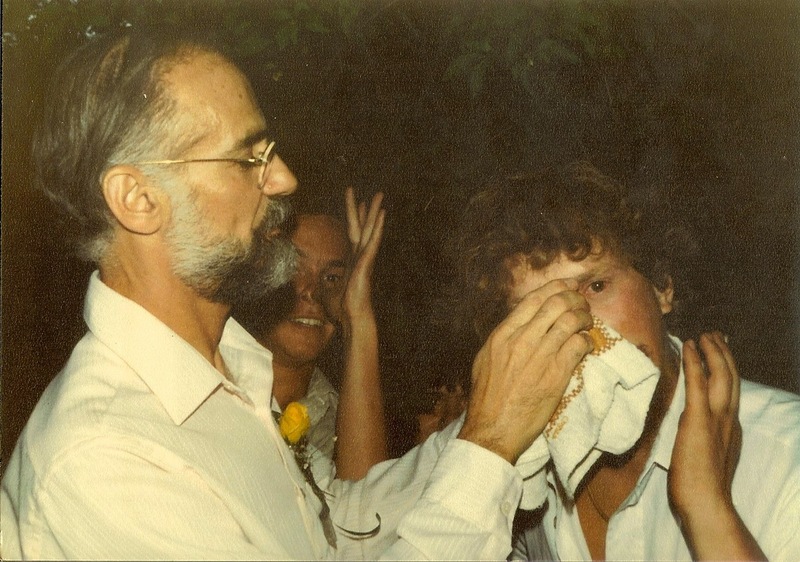 Katherine and I got married on Aug 5, 1982, a month or two before the photo above showing Lynn and me on our nascent house in the woods. Lynn, being my best friend, drove up to Salt Lake City from Santa Fe with us for the wedding. He always liked challenging dogs to see if they were a “real dog”, which he greatly admired. My dog Pete was a large, no nonsense dog who was also quite independent and didn’t have much tolerance for teasing. After the ceremony in my Dad’s back yard, the champagne starting flowing (corks being directed by Lynn and our other friends into our Mormon neighbor’s back yard). As was his habit, especially after a few drinks, Lynn found Pete, got down on his haunches, and bit him (yes, Lynn bit Pete). Pete, not ever one to take this sort of thing, bit Lynn back right on the bridge of his nose. I first noticed the blood on the white shirt that I had loaned Lynn. He came up to me and was incredibly excited: “That dog is amazing! This is the first time I’ve ever been bit back. Normally they just whimper and run away” (or something like that…) He really loved and respected Pete. After my Dad stopped the bleeding, Lynn decided to find Pete and tell him how impressed he was and to apologize so that there were no hard feelings. As soon as Lynn got back down onto his haunches, Pete struck again, this time on the top of Lynn’s head. Blood was running down through his red hair, and my Dad returned with another towel to put pressure on the new wound on his head. Head wounds really DO bleed a lot. Lynn quickly got back into the swing of the party, and before he started a fight with one of my brother’s friends, he started a fad where all of the wedding guests would stand and converse with their hands on their heads and noses. The wedding guests after Lynn's second bite. When it was time for my Dad to drive Katherine and me to the Hotel Utah for our wedding night festivities, we got in the back seat and Lynn got in the front, still applying pressure to his wounds. Dad dropped us at the hotel and then took Lynn to his office (he was a physician) to patch him up. Follow here for more stories about Lynn in future posts. There are a lot of them! Next What a lovely day! I love hearing those stories about him. I have good memories about Lynn. He loved you like he loved Pete. You were very special to him. Just found this because I was specifically searching (not for the first time) for my old friend Lynn. From your description and the photos – that’s definitely he. I can confirm that he graduated high school Lindbergh High School in St Louis County Missouri – with me in ’79. His dad was a ranger at the Arch (Jefferson National Expansion Memorial) back then. Caught up with him during university, probably ’80 – ’81. His older brother built or played dulcimers (or both). I would like to hear more about my old friend. Yes, I had feared that from the tone and tense of your blog. Very sad indeed. Lynn and I paddled down Missouri rivers, explored a cave or two, went to Washington DC on a school trip, and argued a case before the YMCA’s Youth-in-Government Missouri State Supreme Court in ’78 or ’79. You’ll love this: Lynn was cited for contempt by a high school aged supreme court judge who was incredibly impressed with himself. (NB: We’re all absolved for high school behavior, Lynn and that ‘judge’ included.). You can imagine Lynn’s reaction though. It’s funny the things you remember: one was that he used to say the School fish sandwich was just a medium for delivering tartar sauce after slathering on copious amounts. 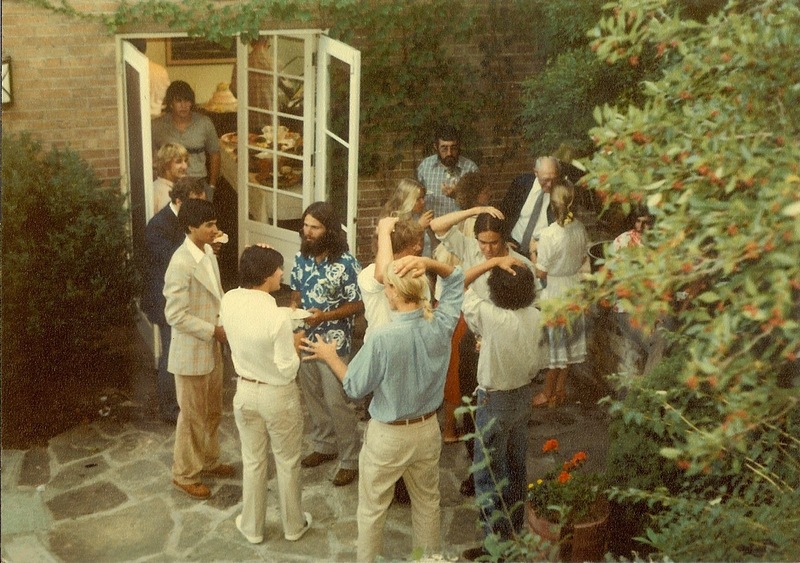 Lynn and I met up one summer in St Louis after he’d left for St John’s – maybe after he’d left there too. It was your blog’s combination of his name and that college that finally gave me a line on what had become of him. I am grateful, having searched several times over the years. I’d hoped to reconnect with him of course. I found his father’s obituary and reached out to his brother from there. Coincidentally, his brother lives near a university friend of mine who quit to join The Peace Corps and reminded me a lot of Lynn. Maybe I can put them in touch as some sort of consolation. Anyway, it would be great to hear more stories when you get a chance. Bruce, I think it’s cool you remember his antics! Would love to hear some stories of the trouble ya’ll got into. Wish I could reprimand him for biting dogs, though! So happy to learn that Lynn has a daughter! I will also contact Wes through FB – which I do not really use very much. Pleased to hear that Wes found this site as well. Art: through registration on this blog you should have my and Charlia’s email addresses. You are most welcome to send her mine.